VMAT is the enhanced version of IMRT in which gantry, MLC, and dose rate are continuously changing during treatment. The dose rate changes can also be observed in sliding window IMRT. In all IMRT and VMAT plans, the monitor unit (MU) for the segment was assigned while doing optimization. There is a chance for the presence of low MU in the segment. The acceptable minimum MU per se gment for IMRT and VMAT plans must be defined by the physicist in the treatment planning system (TPS). This parameter is used by the planning system while assigning MU for the segment while doing optimization. The system always verifies that the MU for a particular segment is greater than or equal to the defined MU. The dosimetric parameters of low MU settings must be analyzed, before setting the minimum MU per se gment in the planning system. Several researchers have reported the characteristics of low MU such as stability, linearity, flatness, symmetry, and reproducibility for various linear accelerators from Elekta, Siemens, and Varian.,,,,,,,,, Different results were reported for the same make of the linear accelerator, which revealed that the characteristics of the beam differ between the machines. In this study, the analysis of dose linearity, stability, flatness, and symmetry of 6 MV photon of the Synergy linear accelerator under low MU condition was performed. Mohr et al. and Fujimoto et al. have investigated the characteristics of Elekta linear accelerator at low MU condition. However, since varying results have been reported for machines of the same model, this study was performed to analyze the individual characteristics of our machine and to define the minimum MU per se gment for IMRT and VMAT plans in TPS. The Synergy linear accelerator (Elekta Ltd., Crawly, UK) is equipped with three photon (4, 6, and 15 MV) and seven electron (4, 6, 8, 10, 12, 15, and 18 MeV) energies and MLCi2 model collimation system with 40 pairs of MLC, 1 cm resolution at the isocenter. The maximum field size coverage is 40 cm × 40 cm; the maximum gantry speed is 6°/sec. A 6 MV photon energy was used for this study with a binned dose rate up to 600 MU/min (i.e., 9, 18, 37, 75, 150, 300, and 600 MU/min) since continuous variable dose rate is not available in the machine. MOSAIQ Version 1.60 × 6 (IMPAC Medical Systems, Inc., Sunnyvale, CA, USA) was used as a record and verify system. Where, L - charge per MU; Lavg- mean charge per MU for all measurements. There is a chance for beam termination in between the treatment due to some problem in the linear accelerator (e.g., MLC position mismatch, voltage problem, etc.) or miscommunication between console and record and verify system. Otherwise, the beam may be interrupted automatically/manually by the technologist to implement the gated IMRT/VMAT techniques. This may lead to small dosimetry inaccuracy due to rounding of part MU delivered in the first portion of treatment. Therefore, the stability of the beam must be analyzed for interruption. To study the stability of MU, the same experimental setup for dose linearity was used. The ionization readings for 10 MU and 20 MU were recorded without interruption. The beam was interrupted for 5, 3, and 2 times for 10 MU and 10, 5, 4, and 2 times for 20 MU. The cumulative readings were recorded for 300 MU/min and 600 MU/min. The beam flatness and symmetry for low MU was studied using Profiler 2 (Sun Nuclear Corporation, Melbourne, USA). It consists of 139 diode detectors with 4 mm resolution. Diode detector sensitivity is 32 nC/Gy. The maximum field size that can be measured is 22.4 cm in cross-plane and 32.8 cm in in-plane. In this study, the profiler surface was maintained at 100 cm SSD with field size of 10 cm × 10 cm. The in-line and cross-line profiles were acquired for the range 1–100 MU for all dose rates. The flatness was calculated using 'variance' method and symmetry was calculated using 'area' method. 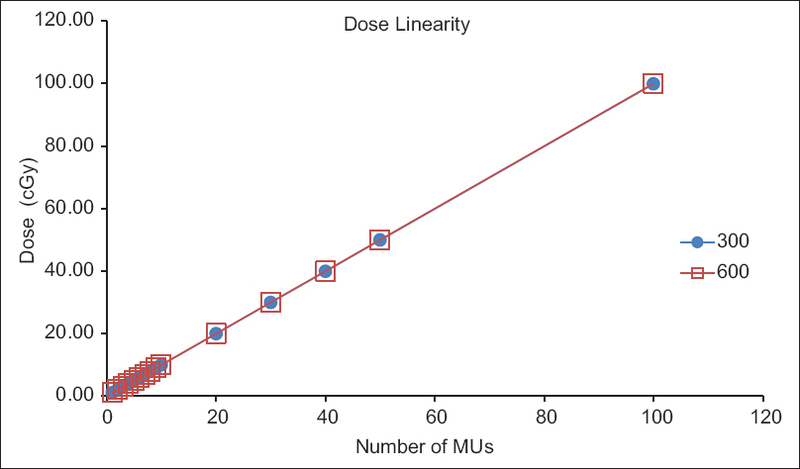 The dose linearity graph between delivered MU and measured doses for 300 MU/min and 600 MU/min is shown in [Figure 1]. 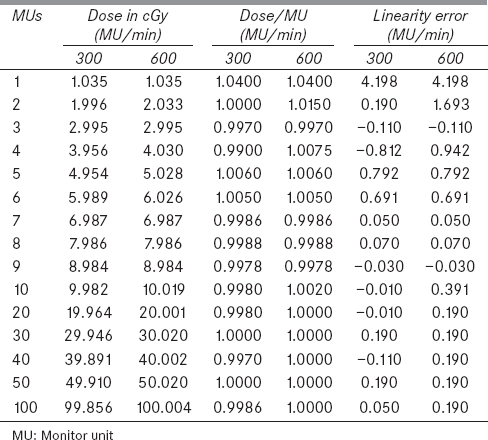 [Table 1] shows the linearity error for both the dose rates. Linearity error was 4.2% when 1 MU was delivered and it was reduced to <2% when more than 1 MU was delivered. The results were similar for both 300 MU/min and 600 MU/min dose rates. The doses for 10 MU and 20 MU were recorded with and without interruption. The percentage of variation with and without interruption was analyzed. The variation is <1% for both 300 MU/min and 600 MU/min dose rates. [Figure 2] illustrates the result of MU stability. No variation was observed in symmetry of the beam while using low MU. However, the flatness of the beam deteriorated as MU decreased to one with low dose rate (300 MU/min). [Figure 3] and [Figure 4] illustrate the result of flatness and symmetry at low MU condition. Several authors have reported the dose differences at low MU delivery for Elekta, Siemens, and Varian linear accelerators. Some authors reported very high uncertainty in linearity at low MU condition. Ravikumar et al. reported 20–40% of dose difference at low MU condition (using 6 MV and 18 MV) for Siemens Mevatron KDS linear accelerator. Reena et al. also reported a linearity error of −32% for 6 MV and −13.5% for 18 MV with regards to Siemens Primus machine. Bhangle et al. conducted a study on 6 MV and 15 MV photon for Siemens Oncor impression linear accelerator and indicated only 2% variation in linearity for ≥2 MU and around 12% variation for 1 MU. Kang et al. revealed more than 10% dosimetric variation for low MU in Varian 21EX machine. The beam symmetry and flatness deteriorated as MU decreased to 1. Mohr et al. reported only 2% variation for 6 MV and 15 MV, whereas Fujimoto et al. reported that standard deviation was within about ±5% for 1 MU and these variations were reduced to ±1.2% from 2 MU per se gment for Elekta machine. Our results revealed that linearity error for 1 MU was high (4.2%) for both the dose rates of 300 MU/min and 600 MU/min. The reason may be that, in Elekta machine, only the first segment is initiated by the electron gun and magnetron, from second segment onward, the beam is initiated from the magnetron only. Reena et al. and Kang et al. also reported very high variation (32% and 4.5%, respectively) for 1 MU and the uncertainty was reduced while delivering high MUs. Our results showed the similar beam behavior for linearity. In this study, the symmetry of the beam profile was within the specification for both the dose rates. Large variation in symmetry was not reported even for 1 MU in any referred studies. Bhangle et al. reported a maximum of 3.4% variation for 1 MU and <2% of variation for ≥2 MU. Flatness of in-plane profile was within 3% for ≥3 MU whereas 3.8% for 1 MU and 3.1% for 2 MU. Bhangle et al. reported 4.88% variation for 15 MV at 1 MU, and within 2% variation for MUs above 2. Many researchers gave various recommendations for the minimum MU per se gment. Reena et al., Bhangle et al., and Miura et al. recommended ≥4 MU, <5 MU, and 5 MU, respectively. Our results showed that the treatment delivered with <3 MU settings can result in an error in dose delivery. Therefore, ≥3 MU should be used as the minimum MU per se gment for the Synergy machine. The dosimetrical characteristics such as linearity, symmetry, flatness, and stability of 6 MV photon at low MU settings were evaluated. Based on the findings of this study, we conclude that a treatment delivered with <2 MU may result in an error in dose delivery. To ensure the correct dose delivery with less uncertainty, it is recommended to use ≥3 MU as the minimum MU per se gment in IMRT and VMAT plans. Studenski MT, Bar-Ad V, Siglin J, Cognetti D, Curry J, Tuluc M, et al. Clinical experience transitioning from IMRT to VMAT for head and neck cancer. Med Dosim 2013;38:171-5. Nguyen K, Cummings D, Lanza VC, Morris K, Wang C, Sutton J, et al. A dosimetric comparative study: Volumetric modulated arc therapy vs. intensity-modulated radiation therapy in the treatment of nasal cavity carcinomas. Med Dosim 2013;38:225-32. Ravikumar M, Al Asmary MA, Alla A Sultan R, Al Ghamdi HA. Dose delivery accuracy of therapeutic photon and electron beams at low monitor unit settings. Strahlenther Onkol 2005;181:796-9. Mohr P, Brieger S, Stahl J, Witucki G. Linearity of the dose monitor system at low monitor units. Strahlenther Onkol 2007;183:327-31. Bhangle JR, Sathiya Narayanan VK, Deshpande SA. Dose linearity and uniformity of Siemens ONCOR impression plus linear accelerator designed for step-and-shoot intensity-modulated radiation therapy. J Med Phys 2007;32:103-7. Reena P, Dayananda S, Pai R, Jamema SV, Gupta T, Deepak D, et al. Performance characterization of siemens primus linear accelerator under small monitor unit and small segments for the implementation of step-and-shoot intensity-modulated radiotherapy. J Med Phys 2006;31:269-74. Akino Y, Ota S, Inoue S, Mizuno H, Sumida I, Yoshioka Y, et al. Characteristics of flattening filter free beams at low monitor unit settings. Med Phys 2013;40:112101. Fujimoto K, Tateoka K, Yaegashi Y, Shima K, Suzuki J, Saito Y, et al. Effects of beam startup characteristics on dose delivery accuracy at low monitor units in step-and-shoot intensity modulated radiation therapy. Int J Med Phys Clin Eng Radiat Oncol 2013;2:1-5. Das IJ, Kase KR, Tello VM. Dosimetric accuracy at low monitor unit settings. Br J Radiol 1991;64:808-11. Miura H, Ozawa S, Tsuda S, Hayata M, Yamada K, Nagata Y. Beam characteristics at low dose monitor unit settings for Vero4DRT. Int J Med Phys Clin Eng Radiat Oncol 2015;4:284-9.